The state of the Bulls, as Forman told it Wednesday after USA Basketball practice at UNLV, is sound physically, structurally and internally. 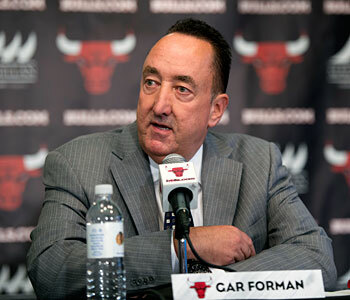 “We were really pleased (about the offseason),” Forman told Chicago reporters. “We said going into the offseason, we had a level of flexibility (where) we thought we could upgrade our team in several ways. We talked about in the spring of wanting to have a deeper team. I think we accomplished that. I think we have quality depth across the board. And then we wanted to improve our skill level and ability to shoot the basketball to space the floor. And I think we were able to do that. So we were very encouraged with how the free agency period went as far as putting the team together and putting the pieces together, the fit with the core guys we have coming back and fit with each other, the guys coming in. “We thought we were aggressive,” Forman added. “And we think we made some additions that will really help this team: From draft night when we moved up to get Doug McDermott, a guy that we had targeted for quite awhile and we thought is real fit with our roster. We gave up quite a bit in two first round picks and some second round picks to get him. And then to add quality depth with Pau Gasol, who has been a big part of championship teams and is a guy whose versatility and skill level fits our team. To get Nikola (Mirotic) over here. We’ve been patient with knowing he was under contract and still young and growing. To get Kirk Hinrich back was an important piece to what we’re doing. To add Aaron Brooks. So we felt good about how it turned out. So these are your 2014-15 Bulls. Let’s see what they have. 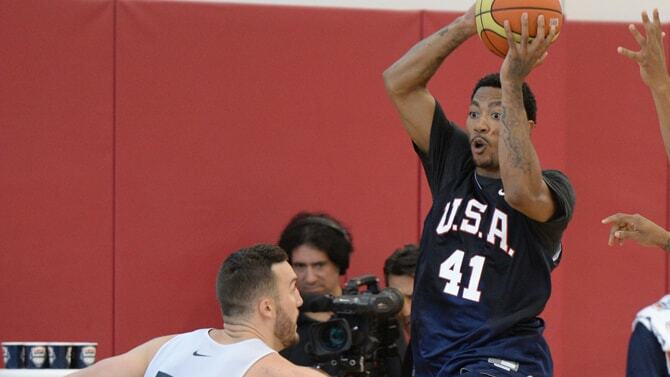 Forman was in Las Vegas along with fellow Bulls executive John Paxson to watch Derrick Rose’s return to high level competition in the USA Basketball training camp to select the 12-player team for the basketball World Cup in Spain starting in late August. Rose is expected to make the team. And while Forman said the Bulls encouraged Rose to participate and are hoping he plays in Spain, they also have been pleased with his performance with their own look toward the Bulls season. “I think he has been terrific,” Forman said of Rose. “He looks strong. He looks confident. He looks explosive. He has been in a real good rhythm. He is playmaking for himself and others. It’s been really, really encouraging. Defensively, it has been incredible to watch him get after guys. Even this morning (in the scrimmages), he had four or five big time athletic plays, blocked shots, steals in the open court. He’s been really, really good. “I think it’s a real positive that he gets an opportunity to do this and do it against the level of competition that he’s doing it against,” said Forman. “It’s great that he gets to play against this level of competition. And it’s just good to see him playing with so much confidence and just playing, reacting and playing. He has been playing five-on-five now for a couple of months. But to do it in this setting that is very structured and the level of competition that he’s doing it against is a real plus. I think it will be a plus for him going into camp in October and obviously a plus for our team. There have been sporadic reports the Bulls still could be interested in other players, including Minnesota’s Kevin Love. But Forman pretty much eliminated all that. He, of course, didn’t close any doors to opportunities. But he made clear the major Bulls decisions have been made for this summer and perhaps closer to the start of the season they’ll fill out the roster with a backup player or two. And that team did go on to win 62 games. So now it’s to the coach, the Congress of the Bulls union, to make things happen.